Maryland's landmark classroom screen safety law went into effect July 1, 2018. Passed unanimously in the House and Senate, and swiftly signed by Governor Larry Hogan, the bill establishes a state mandate to the Maryland State Department of Education (MSDE): consult with the Maryland Department of Health and develop Health and Safety Best Practices for Digital Devices to protect both public and private school children from the well-documented health risks posed by daily classroom digital device use. However, MSDE has instead continued its established pattern of ignoring the serious health impacts of digital device use and assigned its classroom technology proponents, not MSDE student health experts, to draft these critical digital device best practices. The following letter was written to the Maryland Board of Education President, Dr. Justin Hartings, and the other Board members, asking that they intercede to correct the situation, and make sure that MSDE student health experts are included in drafting protections for our children. The letter includes the response from MSDE's staff when asked why student health experts are not involved in this landmark effort to protect students from epidemic myopia, obesity, addiction, sleeplessness, anxiety and depression - all of which are associated with the schools' demand for ever more digital device use. Suffice it to say, it's business as usual in Maryland right now. Advocates for children's health and safety should contact their elected officials, the Maryland State Board of Education and Governor Hogan's office. A review of this process is desperately needed. A practical guide to classroom screen safety best practices follows below; it has been provided to Maryland Department of Health, to MSDE and to the State Board of Education. Let's hope that this landmark effort does not get whitewashed and a meaningless set of best practices is offered instead. As it stands now, MSDE is promising a computer safety video, produced by Maryland Public Television (MPT) - the same people who promote ever more screen use at school and at home. Interestingly, MPT is responsible for professional development training for Maryland teachers; MPT and PBS are among the biggest proponents for the schools' digital agenda. Hardly the health advocacy that the Maryland General Assembly had in mind when the lawmakers unanimously passed this critical effort to protect our children. Ongoing research is shared routinely on the Twitter account, @screensandkids. Please follow that account for the latest developments on Maryland's screen safety law as well. I am writing to request that a recent Maryland State Department of Education (MSDE) staff assignment is reviewed and corrected, to ensure that MSDE is appropriately fulfilling its legal obligations to implement HB1110: "Health and Safety Best Practices for Digital Devices," and to address the current appearance of impropriety as well. The irrefutable public health threats associated with digital device use by children convinced the General Assembly to pass HB1110 during the last legislative session. The law requires MSDE to consult with the Maryland Department of Health (MDH) and draft health and safety best practices by June 1, 2019, to be presented to the local school districts by July 1, 2019. The lawmakers recognized that as a consequence of using the schools' digital devices every day (and night, for studying), Maryland students are at risk for serious health problems. For example, the negative impacts of daily digital device use increase students' risk for myopia, obesity, sleeplessness, anxiety and addiction. The bill was supported by the Maryland State Medical Association (MedChi), the Maryland Chapter of the American Academy of Pediatrics, Prevent Blindness, the Mental Health Association of Maryland and the Maryland Occupational Therapy Association, in addition to several pediatric specialists and child health advocacy groups nationwide. The fundamental understanding expressed by the medical community in its support of the legislation centers on the use of the equipment itself, not on the content - in short, "educational" applications pose the same degree of physical health risks to children as any other use of digital equipment. Practitioners describe this situation as a public health issue facing our children, at the hands of the schools. With unanimous support in both the House of Delegates and the Senate, and a swift signature from Governor Hogan, this new law establishes a clear state mandate: MSDE must protect Maryland students from the known health hazards associated with the schools' digital devices by drafting health and safety best practices. However, MSDE has recently assigned its leading digital learning proponents - rather than student health experts - to draft the health and safety best practices for digital devices. This choice casts serious doubt on the Department's commitment to protecting the health of students or faithfully implementing the law. Rather, the Department now appears more interested in protecting its own digital curriculum than it is, the health and safety of Maryland students. Last month, I met with MSDE administrators who were originally identified as project staff members for the creation of best practices. I was assured that the health concerns which instigated the law would be adequately addressed by school health experts. Now I'm told that the administrators and staff with whom I met have been replaced by leaders of the digital learning initiatives. In a conversation last Wednesday (October 24th) with the Department spokesperson, no explanation was offered for the transfer of responsibility from the MSDE division that routinely handles school health matters, to the digital curriculum division. When I questioned the change in oversight for these critical student health concerns, the spokesperson responded, "MSDE teaches; that's what we do." He continued, "The Department of Health is responsible for the health of children." He saw "no issue" with the state's leading technology curriculum proponents drafting MSDE's student health and safety best practices for digital devices. This situation is intolerable and indefensible. The Governor and the General Assembly have given MSDE a mandate to correct serious public health threats posed to our growing children through the schools' demand for digital device use every day. In response, the Department has shown a complete disregard for student health, and assigned unqualified staff - who also happen to be the most influential MSDE digital device advocates - to carry out this critical effort. The spokesperson confirmed this dynamic on the phone with me, verbalizing that classroom health issues are not among MSDE's priorities; indeed, he suggested that MDH alone was responsible for addressing student health risks, while the focus of his Department was singularly curricular. "I don't see an issue here at all," he said. The notion that MDH has become responsible for implementing this law has been voiced by other MSDE staff as well, which implies an abdication of responsibility. While MSDE's digital platform may be the Department's sole priority, Dr. Hartings, it is hardly its sole responsibility, especially within the specific implementation of this law. The schools' obligation to student health issues is long-standing and far-reaching, from vaccinations, mental health, nutrition, dental health, vision and hearing screenings and safe playgrounds, to sexually transmitted diseases and limiting screen time for child care centers, to name just a few. And while the MSDE spokesperson claimed only one staff member was medically proficient and "couldn't be everywhere at once," the fact is, significant numbers of school health staff are employed by MSDE. 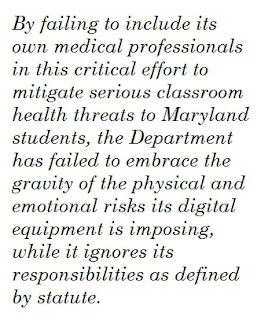 By failing to include its own medical professionals in this critical effort to mitigate serious classroom health threats to Maryland students, the Department has failed to embrace the gravity of the physical and emotional risks its digital equipment is imposing, while it ignores its responsibilities as defined by statute. It is more than disheartening to hear the Department spokesperson disavow responsibility for student health; it speaks to negligence. The Department has both a social contract and a legal obligation to provide a safe and healthy learning environment for all Maryland students. The sole responsibility for implementation of HB1110 is legally that of MSDE, not MDH, which is required to serve in a consulting capacity only. The Department has been well aware of the risks to students for years, and has taken no initiative to protect our children. The negative health impacts were brought to the attention of the Department in 2015; the legislation was originally introduced to the General Assembly in 2016. The Department was made aware that OSHA has regulated the daily use of computers for decades to protect adult users from avoidable harm. State testimony that MSDE knew about also revealed that the equipment manufacturers themselves provide extensive safety warnings which explicitly inform consumers that "serious bodily harm" can ensue if safety warnings go unheeded. The very MSDE staff now assigned to lead the health and safety best practices effort are the same who neglected to perform any due diligence for safety risks associated with classroom devices in the first place, and ignored the well-documented health warnings that have been published and broadcast in medical journals, radio, television, newspapers, and online media and shared in state testimony. They instead continued to encourage increased use of hazardous equipment, without any regard to our children's health, which is what prompted the introduction of the original legislation. Now it is law. The Department should finally roll up its sleeves, get all of its health experts together, and work with MDH to get our kids the protections they need and are legally owed - at last. The serious nature of the ailments related to the schools' equipment dictate that qualified MSDE student health staff are part of the solution. Our children's health needs defending, not MSDE's curriculum. It is essential that the health and safety best practices for digital devices provide meaningful protections to ensure our children are not physically or emotionally damaged by their schools' demands. MSDE must carry out the will of the people as unanimously voiced by every member of the General Assembly and the Governor. The prolonged appearance of impropriety will only add to the public's significant distrust for MSDE, a distrust which is guaranteed to expand if this situation isn't corrected. And while the legislation does not require it, the creation of any sound public policy, of course, requires input from stakeholders. Interim updates on the progress of this landmark student health initiative would also serve the public interest. I am attaching substantial documentation to help you better understand the serious health risks now threatening Maryland students. I've shared this research with leadership in both MDH and MSDE and included specific suggestions for mitigations as well. Ongoing research is also posted on my Twitter account. It has well over 500 followers, that include JAMA Pediatrics, the Pediatric Academic Society, the USC Roski Eye Institute, AAP leadership as well as national education leaders and national parent groups - many of whom are watching this Maryland policy-making, with a hope of replicating it in their states. I hope I can look forward to a response from the Board, as little meaningful communication from MSDE appears to be forthcoming, despite several attempts to discuss this with members of its administration. Assumptions regarding educational versus recreational device use must be addressed and dispelled to ensure that teachers, administrators and parents recognize the fundamental medical hazards posed by the devices themselves, independent of the content. "Educational" applications are just as damaging to a child's vision, for instance, as any other content. Growing children are not just small adults; they are developing in specific stages and at different rates, without a full set of adult physical or psychological capabilities. As such, children are more vulnerable to the hazards posed by devices. Students will suffer more serious damage due to those vulnerabilities, because the related health risks are cumulative and the schools are demanding use of devices at ever earlier ages. Students using devices in an unsafe way will likely suffer a greater variety of long-term co-morbidities as well. For instance, online homework is associated with melatonin suppression, leading to sleeplessness, which contributes to obesity, diabetes and heart disease. Severe myopia is associated with a higher risk of glaucoma, retinal detachment and cataracts later in life. Because the schools are requiring daily device use from students, starting at a very young age, and continuing throughout these developmentally critical stages, extreme caution should be applied when demanding the use of school equipment - equipment that has been regulated for adults by OSHA since the 1990s. New technologies poised for classroom use - including virtual reality tools and applications - will bring even higher levels of risk to Maryland students. It is within this context of increased digital exposures that policy makers must make responsible, well-informed, regulatory and purchase decisions to protect students from known - and future - classroom hazards. The burden of safe hardware configurations appropriately rests with state vendors who are aware that laptops are not designed to be used as full-time workstations. Therefore, according to the manufacturers, the devices must be retrofit with peripherals to establish a safe work environment for students. Those peripherals are necessary to ensure the ergonomic safety of all students, regardless of age or height. They may include a mechanism for raising the monitor to the appropriate eye level, an external keyboard, and an external mouse. Peripherals that ensure student safety should be part of any future purchases, but do not represent a significant cost to the state. Simple, low-cost, adjustable kickstands, for instance are readily available. MEEC can certainly require appropriate configurations when writing its RFPs. Demanding safety from all vendors will go a long way in making the bids more competitive. Finally, a theme runs through most of the documented medical hazards posed to students by these devices, and is echoed in the suggestions for mitigating many of those risks: keep the school's digital devices at school, and stop requiring students to take them home and use them at night. The cost savings that the state will realize in reduced maintenance, repair, and replacement costs will be astronomical (the cost for a carrying case alone is between $35-$50 per student). Keeping the devices at school will also increase classroom productivity because the devices will be intact, operable, charged and ready for use in class when needed. Many of the documented health risks to Maryland students posed by daily use of the schools' digital devices are listed below, with suggestions to mitigate those risks. I have omitted references to radiation and wi-fi routers, since ample documentation is already compiled by MDH. I have also omitted any reference to cell phone use as those devices are not school-issued. Extensive additional medical references, studies and reports are available on my website www.screensandkids.us. The links contained herein are provided for your quick access to some of the more definitive or recent scientific evidence, underscoring the need for the best practices you are tasked to develop. - Schedule device use within grade levels to ensure routine breaks from screens on a daily basis. For instance, when device use is required in the first period, it must take place in the first 20 minutes of class. The next 20 minutes would be used without screens. Then in 2nd period, device use would also take place during the first 20 minutes, followed by a break. Third period, the same first 20 minutes. Each grade level team could determine what part of the class they would prefer, as long as the use and breaks were consistent throughout the school day. - Increase recess and outdoor classes. Sunshine has proven to be a key factor in the mitigation of myopia. It stimulates dopamine in the brain, which helps to curb the elongation of the eye that is taking place when the child grows. That elongation helps to create the refractive error. - Work toward increased eye exams - not just vision screening - for all students. The schools may be unwittingly exacerbating pre-existing conditions; one third of all students needs a comprehensive eye exam. - Begin public health information campaign to alert families to risks at school and at home from excessive screen time; strongly encourage more breaks and more outdoor play. - Develop classroom posters that remind teachers and students to take breaks; duplicate posters as flyers to be used at home. - Develop classroom contracts similar to those needed for science class that outlines for the teacher, student and parent what the risks and mitigating practices are regarding the safe use of the school's digital devices (emulate the approach used for lab equipment). - Hazardous blue light is absorbed more by children because their lenses have yet to develop the protective pigmentation that provides adult eyes a bit of protection from retinal cell destruction caused by blue light, emitted by digital device screens. - The light travels to the back of the eye - the macula - and the process permanently destroys the cells needed to see. This process has been recognized as part of aging. It has been called age-related macular degeneration or AMD. Today, signs of macular degeneration are being seen in much younger patients as a result of screen use. - Blue light suppresses the production of melatonin, the hormone that regulates sleep. Sleeplessness is directly associated with anxiety, depression, poor academic performance, and obesity. Obesity is epidemic among children today and leads to heart disease, kidney disease and diabetes. That's why the American Heart Association published a statement this summer calling for screen time limits for children. - Blue light filters should be installed on every school-issued digital device and made a basic requirement for all future RFPs. - No homework should be assigned on devices. Schools cannot control the time which students use the schools' equipment, and therefore, could be contributing to the interruption of critically important healthy sleep patterns, since many students are doing homework late in the evening. - To protect students from the serious risks posed by blue light exposure, the use of screens in the classroom should be limited to actual school work; "free play" or "quiet time" should not be spent using devices. - Children (and adults) blink 67% less often when using digital devices, which has caused a significant rise in dry eye disease symptoms in younger patients. Severe dry eye can permanently damage the cornea. - Dry eye disease and computer vision syndrome are closely related since the symptoms can overlap: red, scratchy eyes, blurred vision, headaches and tearing. - The student's discomfort can interfere with academic performance since the child finds it difficult to concentrate. Moreover, if children are accustomed to experiencing this discomfort, many will find it "normal," and not report it to an adult. - Sore necks, back pain and shoulder discomfort are also related to computer vision syndrome, as those muscles can also affect a student's vision. - Undetected, unreported chronic eye discomfort can be a sign of more serious conditions and permanently damage children's eyes and vision. - Adhere to manufacturers' safety guidelines for safe workstation settings to include monitor height, monitor angle, and proper settings for glare and contrast (and audio settings - which are often ignored, and necessary to protect students' hearing). - Review classroom seating and overhead lighting to minimize glare and reflection from windows or other light sources. - Ensure proper ergonomic posture among students; require proper posture to avoid muscular discomfort. - Train teachers and school nurses to recognize the signs of discomfort when children are using devices, and develop policies to offer paper alternatives whenever possible. 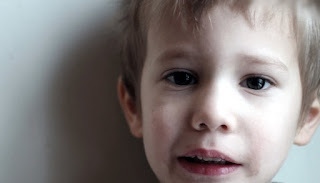 - Teach children to recognize and report their own symptoms of dry eye or digital eye strain. - Make these issues part of the overall public education component (classroom posters and letters to the home) for digital device screen safety. - In all cases, encourage parents to provide a full eye exam for their children and establish a policy of uniform, scheduled breaks from the screens throughout each school day. - little awareness of screen addiction; it is exacerbated by the constant demand that students use devices regardless of healthier alternatives that would serve the same purpose, and also made worse with the increase of educational "gamification"
A clear understanding of the educational benefits and health risks posed by these devices must emerge so that they are used to their best advantage, without harming students in the process, visually, physically, or psychologically.